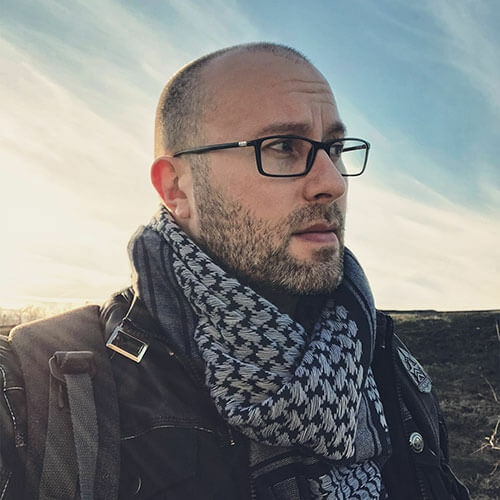 Adron Buske is a speaker, writer, interviewer, and multimedia storyteller. A digital media professional since 2001, he spent 11 years in the radio industry as a digital creative director and corporate executive. He has worn many creative hats: video director, graphic designer, web developer, fashion photographer, performing musician, gaming festival organizer, and voice talent. Adron is a frequent speaker at pop culture conventions around the country, presenting seminars about entertainment careers, the craft of storytelling, and ways to power-up your life using concepts from gaming and fiction. He hosts the Fictitious Podcast, interviewing authors about the storytelling craft of Science Fiction and Fantasy. As host of the Nerd For A Living Podcast, he interviews actors, authors, filmmakers, animators, and other entertainment professionals. Adron lives near St. Louis, MO, with his brilliant wife, Wendy, her autistic brother, John, and their feisty terrier, Domino.